Ever since the girls saw children their own age running stalls at a homeschoolers’ Spring Fair, six-year-old Brioni has been thinking about what she can sell and how she can sell it. 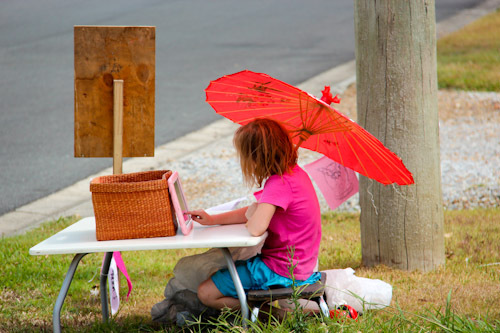 Today, she set up a table on the side of the road to sell the macadamia nuts that she collected yesterday and de-husked. 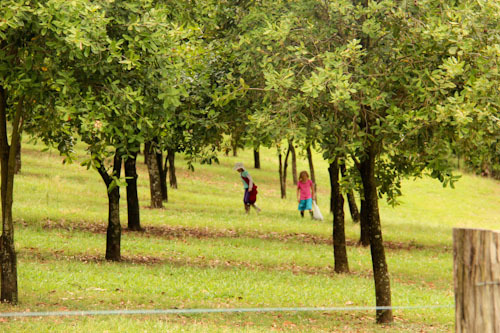 Aisha and Brioni collect fallen macadamia nuts from an orchard. This orchard is still immature and its nuts are not yet being harvested for sale, so the girls find enough to keep them happy! 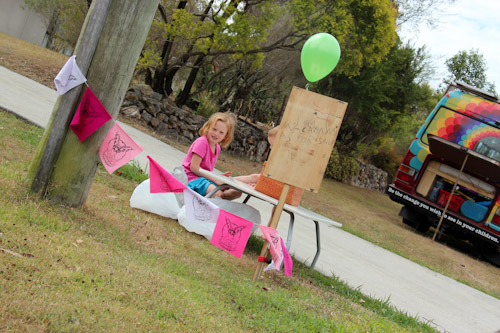 Working independently, Brioni makes a sign and brings it and a small table to the front of the driveway where she's setting up shop. 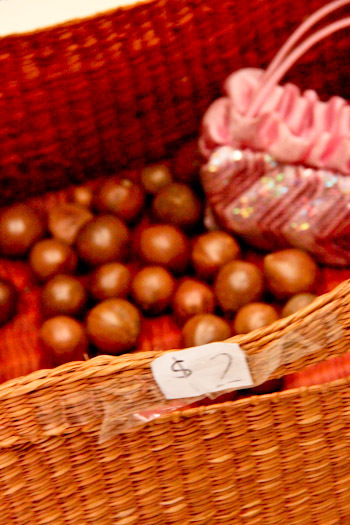 For $2, you can fill a bag with as many macadamia nuts as you want, as long as you leave some for others. Brioni evens takes some bunting from the shed to attract buyers to her stall! I park the bus out the front so I can work on it while I stay close by. While she's waiting for customers, Brioni plays on her kipi. She has bags ready for her customers. Although Brioni only serves one customer this afternoon, she displays her priorities by deciding to close her shop when friends come and are available to play. I wonder when and where we’ll be when she next wants to make a little bit of money! Brioni’s stall is a good example of how unschooling integrates the learning of math concepts. Some homeschooling parents lack the confidence that their children will learn a full set of life skills if they are not also forced to do some schoolwork. We must remember that schools are an inadequate imitation of the learning that happens in the real world. Schools first formed when knowledge was the domain of the well-educated elite. Now knowledge is available freely to whoever wants to ask the questions. Instead of learning in a classroom, homeschooling gives children the option of learning in context. Given freedom and encouragement, Brioni is learning about money without having to colour in arrays of coins in a workbook. We inhabit a literate and numerate world. If raised alongside loving, mentoring adults, there is absolutely no way that a child will not absorb the skills necessary to decipher script and process numbers. Money is only a small part of everyday maths. Time, fractions in baking, calculations in distance while travelling, percentages in battery power, vehicle speed, dividing items equally among siblings, weighing ourselves, birthdays — all these rely on math knowledge and skills. Our children are willing and able to learn the skills they need to grow into adults who can function in society — we just need to be as willing and able to step out of the way to see what society they will form. Will it be the heavily marketed, consumer-driven, tightly-budgeted economy of the last couple of decades, or will it be a gentler, generous, more equal cooperative where people can take what they need for $2 — provided they save some for the next person? For our children’s sake, I hope it’s a nicer world — the world that Brioni is selling to right now. Let her bring the change we want to see in the world. Let me be that change too. That is a very cool quote. Thank you for sharing your thoughts about parenting, homeschooling and life in general. I really enjoy your blog. I believe homeschooling allows children to experience learning in real contexts and follow their interests and passions. Teachers, more and more, are providing real contexts for learning. 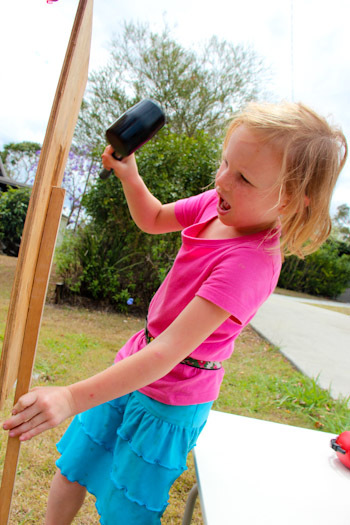 Play based learning, discovery learning, self-directed learning, meaningful real-life projects relevant to the school, children and community. Today’s schools have moved away from textbooks, ‘lessons’, and ‘one size fits all’ learning. Learning is linked to prior knowledge and experiences and teacher’s are open to being guided by childrens’ interests and direction. “We must remember that schools are an inadequate imitation of the learning that happens in the real world. I believe that all learning is valid whether it is at home or at school. I don’t believe home-schooling is inadequate as a learning foundation and I feel hurt that you would judge my educational choices in such a way. Have you spent much time in a classroom? Do you know how hard (and how many hours) the teacher’s work because they genuinely care about their kids and their learning…just like a mother. 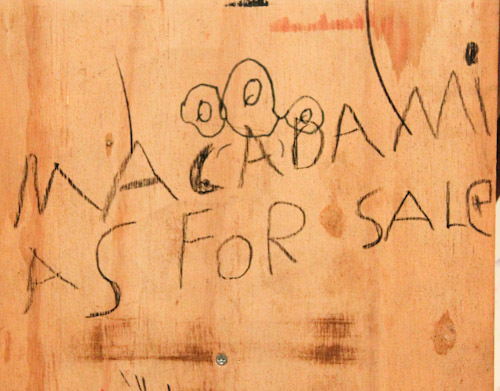 No, Schooling is not the ideal and does not work for everyone. I don’t make judgements about home-schoolers and I would appreciate it if you didn’t make judgements about schoolers. Thank You Annie – I too am quite offended at this judgement. My students do learn with real money playing shop. and guess what they get more than 1 customer so plenty of practise. I do agree with the previous 2 comments. The schools that my child has attended have been a world away from sitting with text books. They go out exploring, they build walls, they go bug hunting, cooking, planting and looking after their own vegetables etc. This seems to be the case in early years at least – I can’t yet comment on later years. I think your perception of school may be a little outdated and certainly doesn’t apply to all schools. Schools these days have a lot of “learning in context” I’m happy to say as I agree that this is the best way to learn. I agree about the judgemental comments too. You come across as feeling quite superior to others due to your choice to home school. From reading your other posts you would appear to be a warm, welcoming person, so I don’t understand your self righteous attitude that comes through when you write about home schooling versus traditional schooling. I agree with the previous post that you seem out of touch with how modern schools teach. Our school provides hands on learning experiences each day. My daughter just had ducklings hatch and grow for two weeks in her class and is going for a walking excursion in the local area tomorrow for HSIE. Maybe instead of being ignorant of current teaching practices and bagging out schools, you should let people make the right choices for their children and stop being so judgemental. From your comments, it seems that the best classes are those that imitate real-life situations really well. I am glad that these classrooms exist, as I am glad that we have choices in the way we educate our children. I have no doubt that if I was in any other parent’s shoes, I would be making the exact same decisions as them. We parent according to the formative stories we have received, the relationships that are around us, and the lifestyle we have. My personal bias is for homeschooling and for unschooling in particular, but this is something that has grown over the years as I have researched education, childhood learning and modern resources. I don’t expect others to agree, but I do present my viewpoint for those who seek an alternative to the main-stream. I think the posters above are overreacting – school is an imitation of real learning, and is very often inadequate – not all schools are great, not all teachers are great and even where project based learning is undertaken – a play shop for example can never replace the real life scenario – in the rest of your life you will never spend the majority of it with 30 other people all within 6 months of your own age – so school is inadequate in that respect for preparing you for real life, at the very least. She wasn’t being judgemental about individual choices to send your child to school, she was expressing her opinion, and it Lauren’s blog, about Lauren’s experiences, not a cross-party, please everyone amalgamation of ideas, so I think you should get off your high horses and take a deep breath! Wow, this really is an emotive topic but I can’t help but agree with the above poster. This is Lauren’s blog and therefore a platform for her to express her opinion. I’m sure if she was asked to write a piece for a newspaper or similar public forum, she would state ‘in my opinion mainstream classrooms are inadequate…….’ This is simply not necessary here due to the function and purpose of blogs. My children attend mainstream school and for the most part we are extremely satisfied with the education they receive. However, they are only there for six hours a day and I’m not so presumptuous to believe that their entire education is taken care of in those hours. Any shortfalls that I perceive are picked up in our home and family life. My children’s education is my and my husbands responsibility and we treat it as such. I’m so happy and confident in our decisions that I see the choices that others make and respect them rather than compare them our choices. Aren’t I lucky and blessed to live in a country where I am able to choose the education our children will receive…..for free! I am interested to know, should one of your girls decide they want to be a doctor how will you provide them with the prerequisites to get them into university? Are you at all concerned that their level of education may already be beneath their peers? and how will you make sure they are adequately prepared to follow any path they choose when they are older? Many homeschooled children enter tertiary education, either through credits gained in TAFE, by sitting exams or with mature-entry requirements. One of the wonderful things about dedicating my life to my children means that I can offer them opportunities to pursue their passions and their interests so they will be able to excel in whatever field of study or lifestyle they choose. There are many people who have homeschooled/unschooled before me, and some wider research will show that our children are not disadvantaged, although learning outside mainstream Western educational institutions.